"According to Israel, the Iron Dome defence system saves lives. Now, several other countries, including Canada are buying the technology for themselves. Canada signed a contract to purchase part of the Iron Dome radar technology with a delivery date of 2017." No more worries about being hit by Hamas rockets Canada. 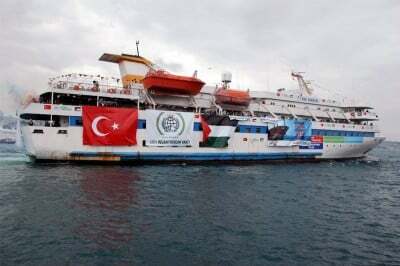 And always good to give more money to Israel too..
A Spanish court has issued arrest warrants for Israeli Prime Minister Benjamin Netanyahu and other senior Israeli officials for their role in the 2010 attack on the Freedom Flotilla heading to Gaza, local media reported on Friday. ...the obvious question is, where is the Canadian justice system in all this? Were there not a least 2 Canadian victims involved and did they not try to initiate a court action in Canada? Is this being reported in the Canadian media? What is clear is that a groundswell movement must grow in Canada that categorically rejects the media including and especially the CBC and the so called Canadian justice system...check out the latest outrage in the conviction of Arthur Topham for exposing a Jewish writers attempt at German genocide 1941! "On November 20, 2015, former Naval Intelligence Analyst Jonathan Pollard, the American-Jewish spy for Israel, was freed by the Obama regime under Zionist pressure after repeated refusals by three Republican and one Democratic President and over the objections of the heads of all 27 major US intelligence agencies. The significance of this release has to be viewed against the history of Pollard's crimes..."
Whenever Israel commits another atrocity, its propagandists stage a revival of the 'New Anti-Semitism' extravaganza to deflect or squelch global condemnation..."
Is Youtube in Cahoots With Israel To Censor Palestinian Videos? "Representatives from video sharing YouTube and parent company Google have met with a high-ranking Israeli official to discuss ways in which 'inflammatory material' can be censored on the web. Tzipi Hotovely, Deputy Foreign Minister of the Jewish State, met with representatives of Youtube and Google last week to elaborate ways of enhancing cooperation in censoring content that's 'inciting violence and terrorism', Middle East Monitor revealed. A joint mechanism of 'monitoring and preventing' [materials] that qualify as inflammatory by Israeli authorities is set to go into effect soon, according to the Hebrew daily Maariv." "The deal, as it stands, will allow Israel to recruit 20,000 Chinese construction workers via private recruitment agencies,' according to a joint statement from the groups. In order to pay the exorbitant commissions charged by these agencies, Chinese workers will have to commit to massive loans before entering the country,' it notes, making them more vulnerable to exploitation and abusive employment practices without protection under Israeli labor law..."
"In a somewhat cryptic remark in an interview hosted by the American Enterprise Institute (AEI) Tuesday, Prime Minister Benjamin Netanyahu raised the imaginary possibility of the establishment of two or three more 'Israels' throughout the Middle East and North Africa, which he said would be located in or near present day Libya, Afghanistan and Yemen..."
"The Israeli regime has summoned a 12-year-old Palestinian girl for interrogation at a detention center. A picture of Hadeel Rujbi was published on the Palestinian video twitter account on Tuesday. The activist page, which puts video and pictures of Israel's atrocities, says it published the girl's picture because 'such Israeli acts of terror against Palestinian children are hardly ever mentioned by the international media." "There has been a sharp increase in violence by Israeli settlers in recent years, almost none of which is investigated and prosecuted, according to the Israeli human rights group Yesh Din..."
"The Zionist State never intended to be democratic or tolerant; From its very inception it created racist laws and used terrorism to achieve its goals, giving its terrorist forces the benign name of Israeli Defense Forces. Its goal was and remains genocide of the Palestinian people." "The US has the right to spy on Israeli officials as the Tel Aviv regime has long been breaching America's sovereignty through its espionage, says an American intelligence expert..."
"Violent Jewish extremism in Israel, like Islamic State, needs to be confronted and destroyed..."
"Israeli media has released footage showing Jewish extremists calling for the killing of more Palestinians..."
"Israeli planes reportedly sprayed agricultural crops along the Gaza border on Wednesday, with pesticides that have been killing off crops for the third day in a row. Thabet alleged that Israeli Forces deliberately spray pesticides periodically on agricultural lands near the Gaza-Israel border to destroy crops..."
Here is a nice story about the rights of Israeli Palestinians. Apartheid is alive and well. A flight from Athens to Tel Aviv has been delayed for almost two hours after a group of Israeli Jewish passengers refused to fly with Palestinians on board, reportedly accusing them of being “terrorists”. Aegean Airlines flight 928 was stuck on the tarmac on Sunday night as the altercation continued, with the Jewish passengers preventing the plane taking off by standing up until the two passengers they complained about were removed. The Greek crew did not initially understand the cause of the dispute, Maariv newspaper reported, and continued with preparations as the two passengers from East Jerusalem were bombarded with accusations. The complainants claimed the Israeli Arab citizens could be “terrorists”, according to Israel Radio, and demanded to search their luggage even after they had left the aircraft, but were refused by stewards. "A Republican lawmaker at the US Senate was bribed one million dollars by Israel to sabotage negotiations between Tehran and world powers including the US. Senator Tom Cotton (R-Ark) received $960,250 from the Emergency Committee for Israel, a right-wing political advocacy organization based in the US, for his senatorial campaign." "As US-driven wars plummet the Muslim world ever deeper into jihadi-ridden failed state chaos, events seem to be careening toward a tipping point. Eventually, the region will become so profuse a font of terrorists and refugees, that Western popular resistance to 'boots on the ground' will be overwhelmed by terror and rage. Then, the US-led empire will finally have the public mandate it needs to thoroughly and permanently colonize the Greater Middle East. It is easy to see how the Military Industrial Complex and crony energy industry would profit from such an outcome. But what about America's 'best friend' in the region? How does Israel stand to benefit from being surrounded by such chaos?" "A report by a rights group has detailed the ongoing Israeli campaign of brutality against Palestinians, saying the Israeli regime has engaged in the extra-judicial killing of Palestinians..."
"Germany has delivered a fifth submarine to Israel. The TKMS vessels are among the most advanced non-nuclear submarines worldwide. Critics in Germany have alleged Israel may adapt the subs to fire nuclear missiles. Chancellor Angela Merkel has repeatedly said she feels a special obligation to Israel's security, in light of the Holocaust committed by the Nazis..."
"...Just as the Supreme Court decisions I referred to above displayed Israeli racism resplendant, Adel's theft from Daniela confirms that Israel is a state in which religious identity trumps individual or democratic rights. It further confirms that Israel is not a democracy but a theocracy in which Jews reign supreme. That the system can kidnap children and wrench them from the arms of loving parents merely because it disapproves of a lifestyle or marital choice, is part of the sickness afflicting Israel..."
"Sweden's Foreign Minister Margot Wallstrom has called for a 'thorough' investigation into the killings of Palestinians by Israeli forces in the past few months. 'It is vital that there is a thorough, credible investigation into these deaths in order to clarify and bring about possible accountability,' Wallstrom said during a parliamentary debate on Tuesday.."
Time for someone in Ottawa to say the same. "Prisoner rights group says Muhammad al Qeq is one of 660 Palestinians held by Israel without trial or charges. Muhammad al Qeq, a 33-year-old journalist from the occupied West Bank village of Dura, launched his fast on November 24 in protest against his administrative detention, a practice in which Israel imprisons Palestinians on 'secret evidence' and without trial or charges..."
"On June 30, last summer, Knesset member Ayelet Shaked called for the destruction of 'the entire Palestinian people,' including 'its elderly and its women, its cities and its villages, its property and its infrastructure.' In a statement that has now become infamous (even more so since Benjamin Netanyahu appointed Shaked as his minister of justice) she even advocated killing Palestinian mothers because they give birth to 'little snakes'. The next day, Palestinian teenager Muhammad Abu Khudair was kidnapped and burned alive by six Israeli Jewish young people, and over the coming summer, the IDF murdered over five hundred Palestinian children duriung the Gaza massacre. For the vast majority of Jews, for those of us who are young, who are poor and/or working people, who are queer and/or genderqueer, the racial bribe of Zionism simply isn't worth it, and the sooner we realize this and begin to craft our politics accordingly, the better. We will never be emancipated by investing in the privileges that come from being citizens or potential citizens of a settler-state. [Or Two!] Rather, the key to Jewish emancipation is the same as the key to the emancipation of any other subaltern euro-american community which has been offered the racial bribe: to vehemently refuse it, and to settle for nothing less than the abolition of the system that has held it out, for the dismantle of all settler-states and the entire colonial-capitalist system. From Ferguson to Baltimore, from Unist'ot'en to Elsipogtog, and, in Palestine, from the river to the sea, let us fight to make every single person free." "A high-level American delegation is expected to visit Israel next week to work out the final details of a new 10-year military aid plan. on the top of the agenda, is the technical details of an approximately $41 Billion, 10-year military package, the Haaretz newpaper reported, citing a source involved in the talks. Washington is currently providing Tel Aviv with $3.1 Billion in military assistance, annually and the new deal would likely increase that amount to $4.1 Billion. Israeli officials have urged Washington to increase the aid to $5 Billion. The current aid is separate from the nearly $500 Million in annual US funding for Israel's missile system program in recent years. It is also on top of the US military equipment held in Israel, which is valued at $1.2 Billion. Israel is the largest cumulative recipient of US foreign assistance since WWII. US military aid to Israel has amounted to $124.3 Billion since it began in 1962. Strong congressional [bribed] support to Israel has resulted in Israel receiving benefits not available to other countries." "Israel is seeing a strong and divided reaction to the release of a woman who refused to serve in the army, as she protested against the government's policy of occupation. While having a huge group of supporters, Tair Kaminer was branded a traitor by many Israelis." Bravo Tair and all who resist occupation! Nasty piece of Trudeau bashing propaganda in that second link NDPP. So I ask you, what would Mulcair say? I would suggest that he would say about the same thing because we all know that he wouldn't say the opposite on Israel. Such as 'we don't have Israel's backs' or 'Israel doesn't deserve to exist', and other comments that would be direct contradictions of Trudeau's words. But could we maybe suppose that Mulcair would say nothing? Would that be a possibility, in order to further our common cause of not legitimizing Israel's horrendous human rights abuses. Would you ask that Mulcair do that and then would you mount criticism against him for not saying enough? As you did just a few minutes ago on another thread. NDPP, we must be honest between ourselves, all of us, and recognize that we can't change the rotten state of the world overnight. We can't pull together as the antiwar side against the Conservatives and their appeasement of the US war policies until we do. Of course we can´t change the rotten state of the world overnight...therefore we must be careful with our strategyto never compromise our principles,build our movements from the ground up...enter into stragic alliances from time to time and never never enter into any kind of support for the mendaceous social democratic types, set up to always coopt whatever potential movement from the left! A breathe of fresh air! A voice from the darkness! Man, did you ever nail it and that's the sort of smack down Mulcair deserves and his supporters deserve in order to bring them down from their high and mighty perches. And in fairness, Trudeau may have said too much during the campaign, for which he is being criticized now, he committed a ettiquette slip in his speech that is in question. I suggest that it was meant to be preceived as purposeful for the more perceptive amongst us who honestly care about such things. ...things are moving everywhere now at breathtaking speed! It really is time for activists in Canada to be putting on the pressure on Dion...I don`t envy him or his government.....I`d say it`s a good time to be investing in the tranquilizer business! Most likely the best we can expect is an abstention from Canada. Or maybe not even that. As some would say, and I say to the Liberals, keep your powder dry and wait for the world that opposes the US to be in a position to win the final battle against the apartheid state. The resolution would go a long way if it could get by the US but it won't and so no need to make a huge deal about it. "The Knesset voted against a draft bill proposed by MK Jamal Zahalka of the Joint Arab List, which stipulates the inclusion of an equality clause in Israel's Basic Law: Human Dignity and Liberty. 'The entire world adopts the principle of equality in their laws, and this is the only country that does not embrace equality in its laws. This is clear proof of the state's nature,' Zahalka stressed." "The historical record shows that Israel's rights have not been prejudiced but in fact privileged by the international community. It has not been the victim but the beneficiary of a global double standard. Therefore, the thesis that a primal hatred of Jews accounts for its current pariah status cannot be sustained. Is it not David versus Goliath when a tiny battered people does battle with the regional superpower backed by the global superpower? The sheer cruelty and heartlessness bewilders and boggles. American Jews and Israel: A divorce in the making? you may be in for surprise! Maybe not this time! But soon! The USA is no longer the power they once were...with retreats all over the globe.....this may be a dangerous mistake now, for them to deny this resolution, on some grounds for protecting Israel security! from Ban Ki-Moon, NYT!! Writing on the wall for some historic change? “Some sought to shoot the messenger — twisting my words into a misguided justification for violence. The stabbings, vehicle rammings and other attacks by Palestinians targeting Israeli civilians are reprehensible. So, too, are the incitement of violence and the glorification of killers. “Nothing excuses terrorism. I condemn it categorically. It is inconceivable, though, that security measures alone will stop the violence. As I warned the Security Council last week, Palestinian frustration and grievances are growing under the weight of nearly a half-century of occupation. “Ignoring this won’t make it disappear. No one can deny that the everyday reality of occupation provokes anger and despair, which are major drivers of violence and extremism and undermine any hope of a negotiated two-state solution. “Israeli settlements keep expanding. The government has approved plans for over 150 new homes in illegal settlements in the occupied West Bank. Last month, 370 acres in the West Bank were declared ‘state land,’ a status that typically leads to exclusive Israeli settler use. “At the same time, thousands of Palestinian homes in the West Bank risk demolition because of obstacles that may be legal on paper but are discriminatory in practice. “We continue to work with Israel and the Palestinian Authority to rebuild Gaza and prevent another devastating conflict, and to press Palestinians for genuine national reconciliation. Of course, a lasting agreement between Israel and Palestine will require difficult compromises by leaders and peoples on both sides. The coalition government of Binyamin Netanyahu is on a trajectory to oblivion because its Knesset members are so clever that in their arrogance they have made no provision for future generations. It exhibits an extraordinary lemming-like agenda whereby Its citizens will eventually disappear without trace leaving only the curious artefacts of their political and moral bankruptcy. In 100 years time, future indigenous Arab residents, will dig-up an Uzi machine gun and an old plutonium centrifuge casing from the Dimona nuclear weapons facility in the desert, and will no doubt remember the history of the inept regime of chosen people who used to strut their superiority around that place, in 2016, as their drones disseminated propaganda to a world that had already decided their fate. As for current reality: the EU is nearly ready to implement a long-overdue, paradigm shift that will have huge political and economic impact upon the forces of illegal occupation in the current conflict. Freedom fighters can sometimes be excused for terrorizing the enemy. And the little guy in an assymetrical war against a huge nuclear power can sometimes be excused for using brutal terrorist tactics against their 'enemy'. edit: And I should say that about a 'small' nuclear power too, if there is such a thing? "Israeli soldiers push a disabled man out of his wheelchair after shooting a Palestinian girl in the West Bank." ...so all goods imported to USA from these territories whether Israeli citizen made goods or not.....settlerpopulation or not...will no longer be called Israeli? Opening the door to BDS? Interesting to understand the game going on here...but no doubt Israel is in deep trouble! Are they to be the next sacrificial lamb? As the USA makes its power plays in the Middle East? "We appeal to free people in the world who can help us to put pressure on the Israeli government and let Muhammad [go] free,' Shalash says..."
"A new video has divulged the extent of Israel's continuing crimes against Palestinian detainees.."
"The army urges the political echelon to turn toward a political solution as the only one that has long-term viability." The international community must stop collaborating with these ongoing Israeli crimes! perhaps my info is wrong...but according to Debka and Israeli military intelligence, they are getting very nervous! Will this be an opportunity for sane forces to demand an equitable settlement? Is this why Russia now is working to force a unity agreement amongst the Palestinians? Has Palestinian trained fighters now been stationed on the border with the Golan, with Israel IDF unable to go in to clear them out for the Syria ceasefire agreement? Does this explain the intensive tunnel activities by Hamas on the Gaza side? So...will the present latest intifada break out into something much bigger? "The Palestinian Centre for Development and Media Freedoms (MADA) documented a 154 percent increase in Israeli assaults on journalists over the last three years. The Israeli army frequently detains Palestinian journalists during protests, preventing them from covering events..."
Nearly half of Jewish Israelis agree that Arabs should be expelled or transferred from Israel, and a solid majority (79 percent) maintain that Jews in Israel should be given preferential treatment, according to a Pew Research Center in Israel survey published on Tuesday. Now wouldn´t it be interesting to add some Canadian entities to this lawsuit, such as Air Canada and Mountain Equipment Cooperative ad nauseum.....any takers to help? A group of Palestinians have filed a lawsuit for $34.5 billion against several US-based tycoons, charities and firms over their support of Israel’s settlements on the occupied territories of the West Bank, media reported. According to the Al Jazeera broadcaster, Palestinian activist Bassem Tamimi and 35 other Palestinians accused on Monday Las Vegas casino magnate Sheldon Adelson, philanthropist with interest in property in East Jerusalem Irving Moskowitz, megachurch pastor John Hagee and some other entities of financing the construction of Israeli settlements on the occupied territories. The lawsuit also names such companies as Dead Sea-based cosmetics maker Ahava, industrial powerhouse Israel Chemicals Limited, as well as religious charity Christian Friends of Israeli Communities, according to the broadcaster. No comments from their offices have been received. According to lawyers quoted by the outlet, the suit filed in the Federal District Court of Washington, DC will lead to a trial no earlier than in five years. In the long-standing conflict between Israel and Palestine, Palestinians seek recognition of their independent state, proclaimed in 1988, on the territories of West Bank, including East Jerusalem, and the Gaza Strip. Most of the areas claimed by the State of Palestine were seized by Israel in 1967 during the Six-Day War. The Israeli government refuses to recognize Palestine as an independent political and diplomatic entity. Israel has continued to build settlements in the occupied territories, prompting condemnation from the United Nations.